LADY BIZNESS' Alisha Donahue and Jynx Jenkins are two sweet, smoky broads, from Boise, Idaho, who are winning at life. 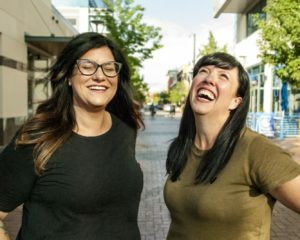 On stage, their utterly unique and seamless blend of standup, sketch, and music skewers womanhood, and leaves everyone with sore laugh muscles for days (it counts as a workout). An evening with “The Biz” is like hanging out with your favorite inappropriate friends, if your favorite friends were recurring winners of The Boise Weekly’s Best Comedian reader’s pick; shared the stage with comedy giants such as Gilbert Gottfried, Fortune Feimster, Hannibal Buress, and Emo Phillips; and just made their debut at The World Famous Comedy Store in Hollywood. Alisha and Jynx organize the annual Boise’s Funniest Person competition for amateur comedians, produce the monthly themed comedy show COOL BIRTHDAY at Liquid Laughs, and manage, between the two of them, to feed six hungry children on a semi-regular basis.